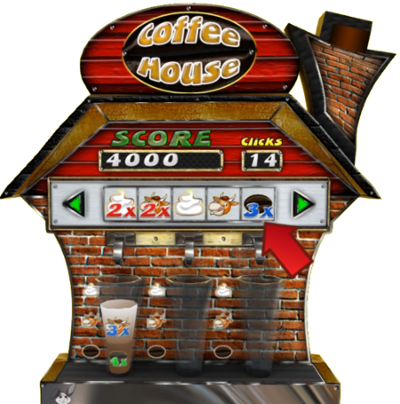 A coffee house game machine Coffee House is a game where you brew cups of coffee. This game does require you to play wise, you have to see the good combinations and act accordingly. 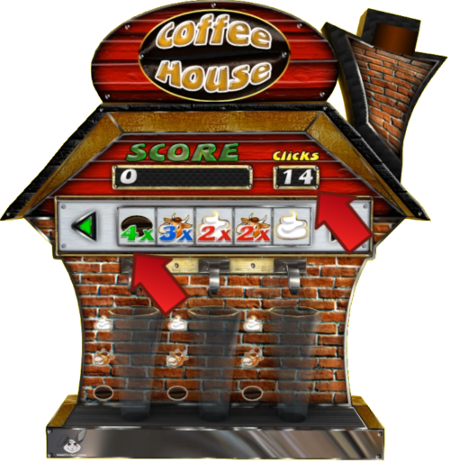 When you are new to gaming in SL, I would not recommend Coffee House. When you are here already a bit longer, this game can be a great new challenge. Scores are set equally fair as on other game machines, but the game does require a different skill set. 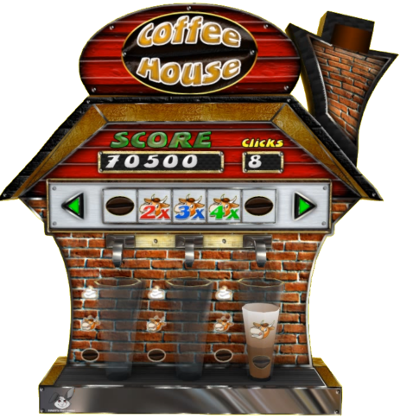 Do practice on a cheap machine until you get it! We offer L$1 games, so you can practice a lot. 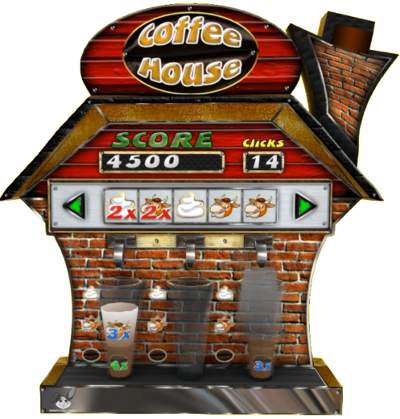 Coffee House is one of my favorite games. The game is really worth a try. You need to fill cups with bean, cow and foam, and do so in this order. Each time you drop either of those in a cup you get 500 points, with the last item, foam the multipliers apply. Suppose you dropped a bean with a multiplier of x2, a cow with a multiplier of x4 and a foam with no multiplier, your score for this cup when dropping the foam will be 500x2x4=4000. There is no limit on the number of cups you can make. There is however a limit on the number of times you can click to move the bar. (We’ll learn what is that later) 15 moves, and the game is over at the moment you try the 16th. 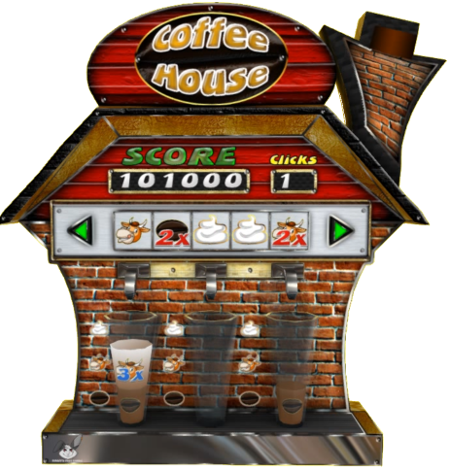 Morenda pretending to be a model, in front of a Coffee house machine At the picture you see me standing in front of a coffee house machine. Note the text above the machine, this shows the score needed to win, on this machine 95501. The amounts show that you”ll win double the amount you paid for, when beating that score. Let’s play this game. We’ll see what happens. I will pay the game L$1, as it is always wise to learn a new game on a low cost machine, and I need to score 99501 in order to win. Directly after I pay the game, it starts. At the picture we see, the score is 0 and the number of clicks left over is 15. 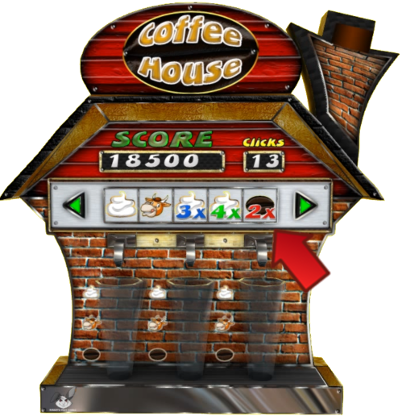 The game always starts with a score of 0 and 15 clicks that can be used to make that score as high as possible. I drew some red and blue arrows on the picture. The red arrows point to the positions on the bar that are above a cup. By clicking the symbol above it, it will be transferred into the cup. The only problem, for none of the 3 cups is a bean symbol. The first thing in a cup needs to bee the coffee bean, so there is nothing we can put in a cup right now. Since I cannot put anything in the cups, I’ll make a move. The blue arrows which I put on the image point to two green move symbols. I can click the left one, then all symbols on the bar move one position to the left, adding a new symbol at the total right. Clicking the right one would make all symbols move one step to the right, adding a new symbol at the left side. I click the left move symbol, that will bring me in a quite nice situation. 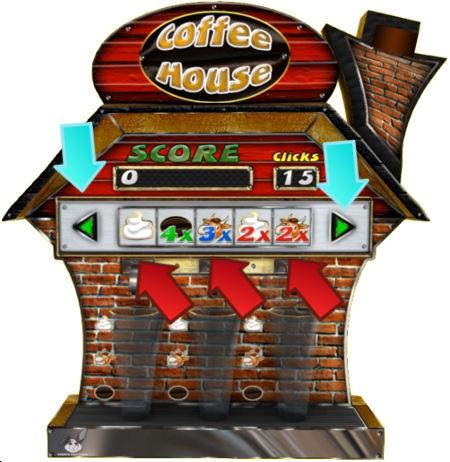 Moving all symbols on the bar one position to the left reduced the number of clicks left. It is now 14, but it also put the bean on the position to mix it into one of the cups. It is a nice bean, because it has a 4x multiplier on it. More important, as you will see soon, I’ll have a clear shot at mixing the entire cup. At the right side of the bar a new foam appeared, that is not really interesting right now. We don’t need foam at the moment. I click the bean in order to put it in the first cup. The bean moves into the cup, making the first layer of the coffee. I get 500 points for that, the 4x multiplier does not apply yet, the coffee needs to be completed for profiting from the multipliers. The bean is in the cup now, so it is removed from the bar, moving all items to the right of it, one spot to the left. Now you see the grand plan – the cow moves above the cup, I can put that in the cup as well, and afterwards do the same with the cream. All without needing any additional clicks. However, I won’t do that yet. At the right side of the bar a new symbol appeared: A bean, I can move that into the rightmost cup, without interfearing with my plan for the leftmost cup. If I used the cow first, that bean would move. After moving that bean in the rightmost cup, we see a new symbol appearing at the right side. It is a cow. 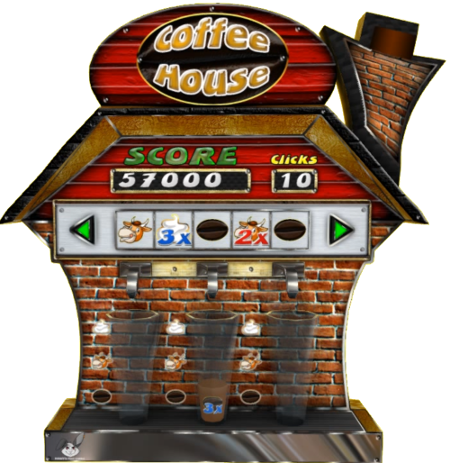 The cow doesn’t come with a multiplier, but we can throw it into the cup without any consequences. 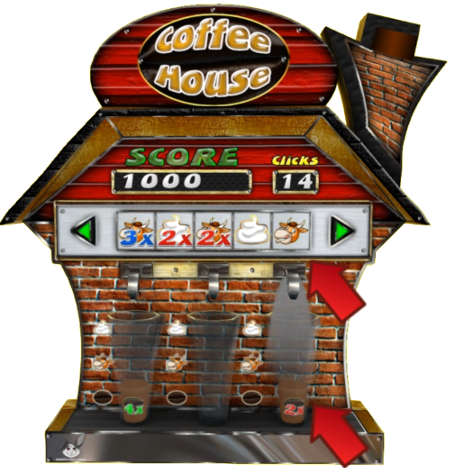 It does not need a click, and who knows a cream comes up next, or a bean which we would be able to get in the middle cup with no click required. After moving the cow in the rightmost cup, another cow appears at the right side. I cannot use that cow, so I continue with our plan at the left side, move that cow into the cup at the left. 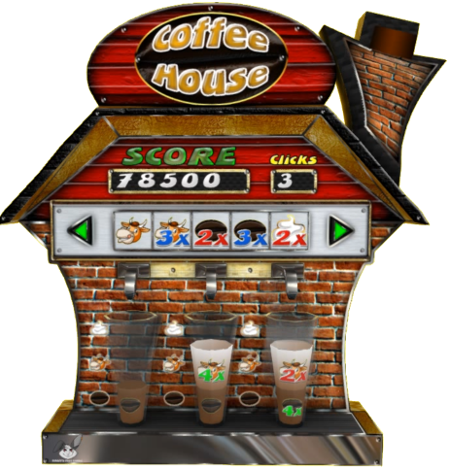 We can expect a very nice score once finally completing that leftmost cup, but because I go slow on it, I am also gaining progress at the left side, being as greedy as I can with my clicks. After moving the cow in the leftmost cup, at the right side a cream appears. Greedy as I am with clicks I move that cow into the leftmost cup. It will complete my first cup and who knows, perhaps a bean will appear at the right side, so I can get even more work done without using additional clicks. We get a new bean at the right, so we play that. And then there comes a cream, with which we can complete our second cup. This cup won’t give a whole lot of score, there is only a single 3X in the cup. Thus we’ll receive 3×500=1500 points when completing the cup. Needing 99501 points to win, this 1500 is not much, but it came for free. No clicks were needed. When reading this description, it might all seem to go a bit slow. We still have only used a single click until now, and gained only a few percent of the total score we need. When playing the game it goes much faster, I usually play lazy and slow and even for me, the part described so far was less than 20 seconds. Let’s finish that cup and see what’s up next. Now I get a cream at the right spot. Only a bean would have been useful. So, it is time to complete the big plan and move the cream into the rightmost cup. 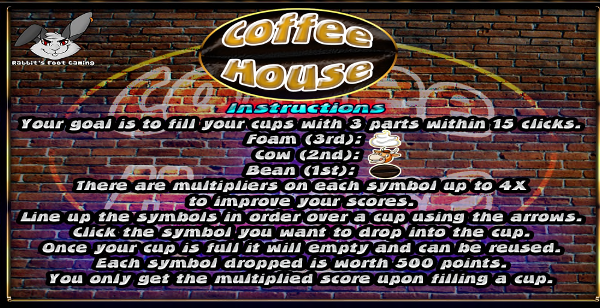 This will do much good to my score, there are a X4 and a X3 in the cup, and the cream will add a X2, thus this cup will be worth 500x4x4x2=12,000 points. After completing this cup, all symbols again move to the left, at the right we get a new symbol. It is cream this time. With all 3 cups empty and no bean at hand, the only option left is making a click. I can choose to click at the right arrow or the left arrow. For items being moved out at the left side (with a right click) there seems to be a rule: The next time an item moves in at this side, it is the same item again. At the right side this rule seems not to exist: Whenever an item moves in at the right side, it is a random item. I could let that rule work in my advantage, dumping unwanted items at the right or saving items for later at the left. At this moment I don’t see how I could use that knowledge, so I just click the right button. A bean appears, so that will be used..
After that comes a cow: Splendid. Oh, now I get a bean and I must think what to do. It is clear a click is needed. 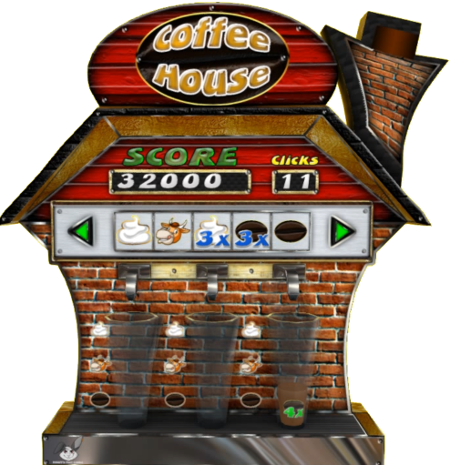 I could just click on the left button again, hope for another bean and otherwise click the left button one more time so the bean will move to the cup in the middle. 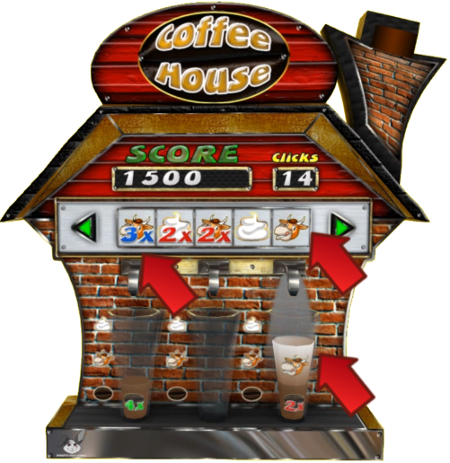 Clicking the right button is a much more beneficial way to go: The cream with a 4x will move above the cup where already a bean and a cow is, completing that cup with 500x4x3x2 = 12,000 points and since the cream will disappear, the bean will move back to where it is now, and I could put that in the cup. click at the right button. Move the cream with 4x into the cup. The cup empties, we get 12,000 points. Move the bean in the empty cup. The score is already more looking like some sort of a score for someone who is going to beat 99,501. But we are still far from there yet. 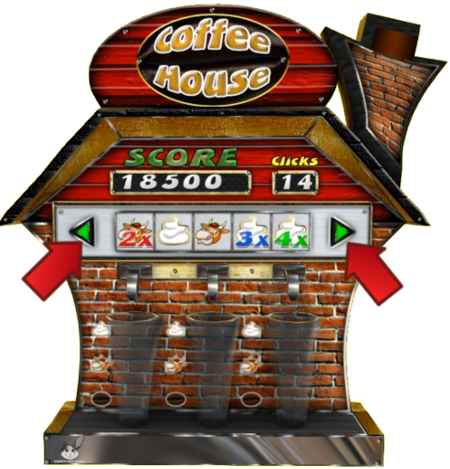 I cannot move anything in any cup, so I have to make a click. CLicking the right button would be stupid, it would only cost a click for going back to the previous situation. So, I’ll do the only remaining thing I can do: A click on the left button. Since clicking the right button is equally less wise as it was previous click, I can only go for the only remaining alternative, clicking the right button. I can again choose between a click on the left button and a click on the right button. Going back to were we came from but left because it wasn’t good is never a great idea, so we go forward to the unknown and click the left button. WOW!! Look at that cow that just walked in. And there is the cream too!!! Moving this cream into the right cup will give 500x4x4x3=24,000 points. Happily I move the cream into the cup, and see what will pop up next. While happily singing a song under my nose, as I already have 56,500 points and still 10 clicks left over, I move the bean in the middle in its cup. Ok, we get a new bean at the right side. Not a very attractive bean either, with no multiplier. I just throw it in the right cup, to get rid of it. 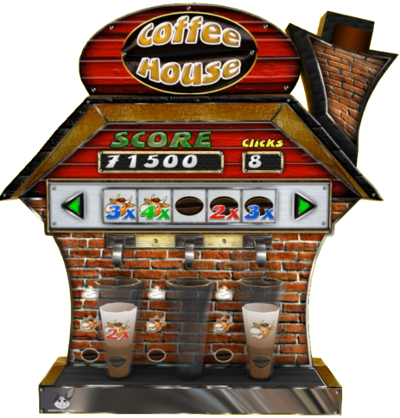 Perhaps now a cream with 4x will show up, I could greatly use that to brew a coffee with a lot of points in the middle cup. We get a cow. Greedy on clicks as we are, it goes in the right cup. And then without much thinking but definitly without spoiling a click, move the cream on top of it. The score makes a nice jump up with the 2 times 4x in the last cup. A bean appears at the right side. I can play that bean too, in the right cup, so I do so. After the bean another cow appeared at the right, so I played that too. After that, yet another cow. 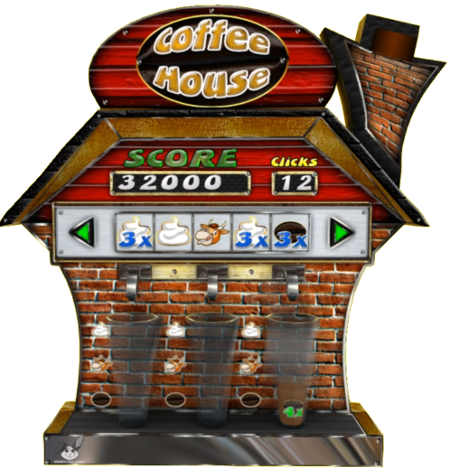 Cream would have been nicer, but I can still continue playing without using a click, there is a cow above the middle cup. I can play that, which will move the cream above the middle cup, I can play that too. Completing another cup without needing a click. Of course, if after playing the cow a cream would have appeared at the right side, I would have played that cream first, but it was a cow. The cup we made gave another 3500 points, which is good. I am not too thrilled about what we have on the bar right now, a lot of cows and only one bean. The bean moves above the left cup, let’s move it in. ..and then the same with a cow. I can move a bean in the middle cup. Afterwards I end up in a situation where a click is needed. I clicked the right button this time, not -as usual – the left button. This has as advantage that we move beans out at the right side. Whatever we would have gotten at the right side, the middle and left cup would become hardly reachable for cream. Three beans have to travel over first, meaning 6 clicks. Better go for the other side, hoping on some cream, that could make those beans usefull too. We really, really need cream. At the right side I get a bean, that is good too…as long as the next one is a cream. I could already move a cow in the middle cup, but I wait a bit. I first click the right button one more time, hoping on some cream. The only sensible thing I can do is make another click on the right button. Changing my mind and start clicking the left one would still give all that beans back. Yes! There is our cream. Now we can start moving again. I have to make one click to the left to get rid of the cow. That will put a bean above the left cup and a cow above the middle cup. and I move that in too…unless something happens at the right, to change my mind. A cream appears at the right. I can play it, so I will. After the cream, a cow appears. That’s useless, so we can play the cow at the left side. However, I won’t play that cow at the left side, as I did some counting. 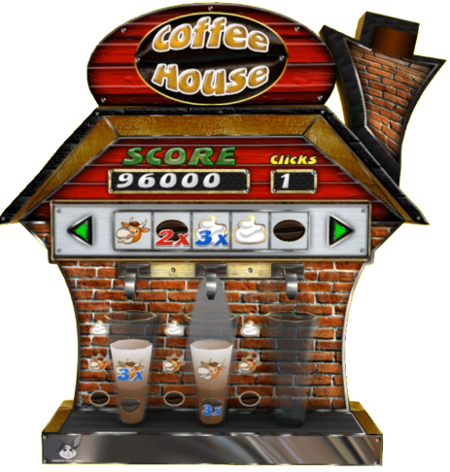 I make a click at the right button, moving the bean to the right most position. Now I can move that bean in, the cow will come back, I can move that in too. The bean is 4X, the cow is 2X. If now only a good cream would appear, I would be close to winning the game. After moving the bean and the cow in, the desired cream does appear. It is not the best cream, only giving 2X. The bean has 4X and the cow 2X, moving this cream in would give 500x4x2x2=8000 points, bringing my total score on 86,500, still 13,001 short from the 99,501 we need. There is an alternative: Using one click on the left button, then moving the cow in the left cup, then moving this cream – that meanwhile moved 2 steps – in the middle cup, in total 4,500 points and hope for a cream with X4 or X3 to show up at the right. One of the reasons I choose not to go this path is that even in the most perfect situation (a cream with 2X showing up) it would bring us to 99,000 points, still not enough to win, and only 2 clicks left. Let’s go for 86,500 points with 3 clicks left. 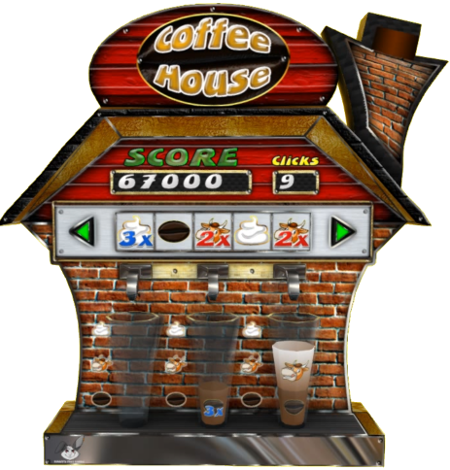 If any good cream turns up, I can still get it in the middle cup, with only one move used, bringing a score only a few thousand less than the 99,000 we would (very) perhaps have otherwise. I move the cream in the right most cup. We did get that cream with 4X. If only I would have known…. So, we already saw what to do now: One click on the left button, then move the cow with 3X in the left most cup. (I could also move the cow with no mupltiplier and then make the click, but that would be dumb) and the cream with 4X in the middle cup. If meanwhile a bean appears at the right, we’ll use that also, of course. 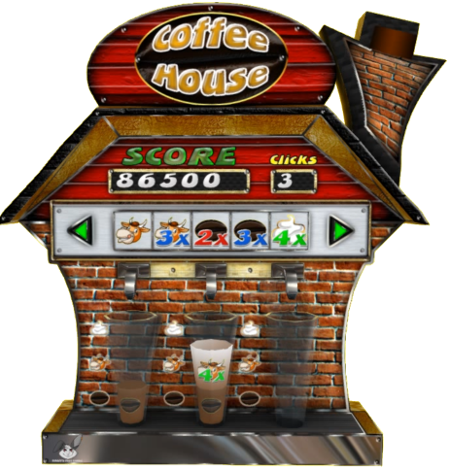 After all that is done, no bean showed up at the right we sit with 95,000 points and 2 clicks left. Look at the bar, and start smiling. We only have to make a single slightly smart move and we will win this game. 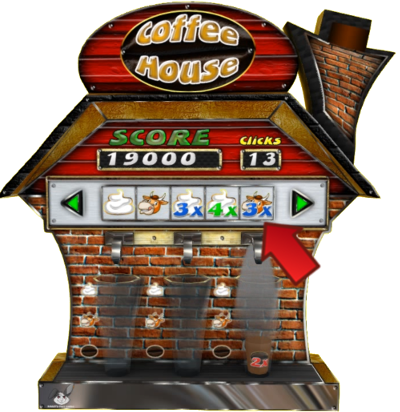 Click on the right button, the bean will move above the middle cup. Move the bean in (500 points) and then the cow will move above the middle cup, move that also in (another 500 points) and then the cream will move above the middle cup (500x3x1x3 = 7,500 points). Situations as this are the fun of playing coffee house. An extra bean shows up at the right, half way my path to victory, I place it in the right cup. Why not get a few extra points? A splendid 101,000 points. We won this game !!! There is still a cow we can throw in the right cup, and there is still a move left over. I will make a few extra points with that, but this game is done, it is not lost but won! Did I need some luck? Yes I did, and I got it. But the main reason for this victory is a different one: I played smart, looked at the board and made the right choices. You like to try something completely different, you love using your brain while playing? Try coffee house!! Ohhh…and one more thing…as a sort of disclaimer: I did play the game described above not bad, perhaps even rather good, but I am not the best player in the world. It is very possible I overlooked opportunities and did not always made the most wise choice. It is up to you to practice, get used to the game and find your own ways and strategies.